Hand-colored illustrations of the “Small Burnet” and the “Large Common Burnet” in William Salmon’s Botanologia. 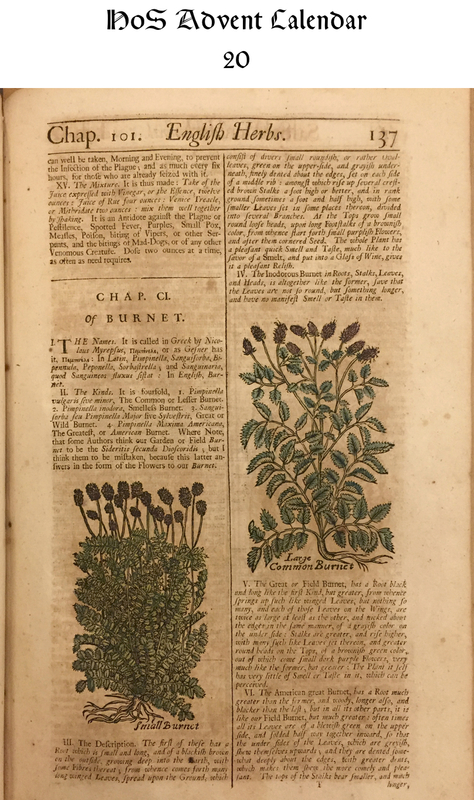 The English Herbal (London, 1710), from Haverford College’s Quaker & Special Collections, call# QK41.S17. In 1710 the English empiric and author William Salmon published the first volume of his massive Botanologia. The English Herbal . 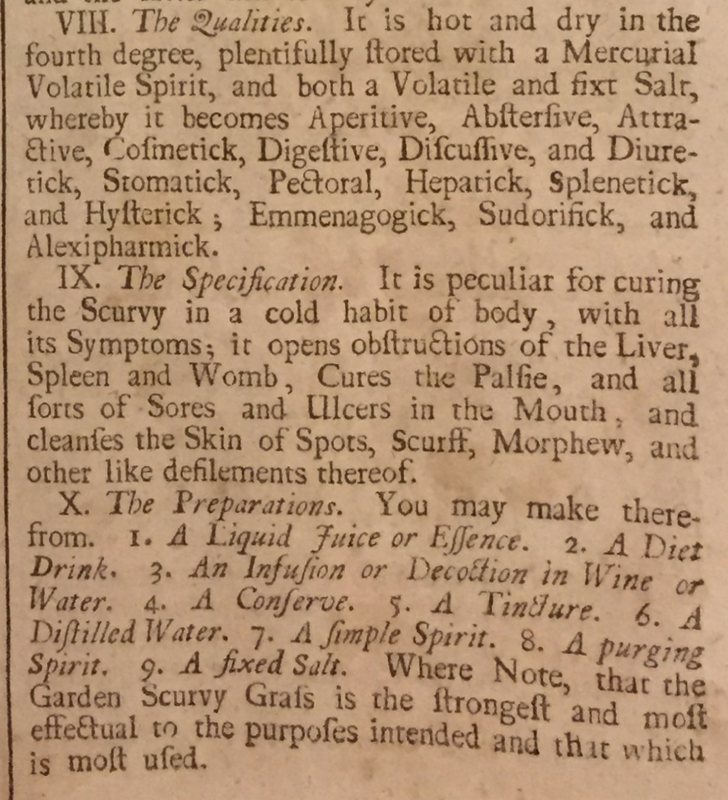 Like most herbals, entries included names of plants, varieties, descriptions, where the plant grew, its qualities (e.g., hot or cold, dry or wet), its virtues, when it flowered, how to combine it with other ingredients to make medicines, and a list of ailments it was supposed to cure. Entries were also illustrated, showing the different forms of the plant. In Haverford’s copy, some of these illustrations have been hand colored, as is the case here with the Small Burnet and Large Common Burnet. Herbals were relatively successful books in early modern England. Early herbals seemed to have been translations of closely derived from continental texts, e.g., John Gerard’s Herball (1597) borrowed closely from an English translation of Bock’s Kreuterbuch . Over time new plants were introduced to the herbals, e.g., scurvy grass becomes common in later English herbals such as John Parkinson’s Theatrum Botanicum (1640), Nicholas Culpeper’s Complete Herbal (1653), and Salmon’s Botanologia . I suspect there is a connection between scurvy grass’s incorporation into the herbals in the middle of the century and the scurvy epidemic in 1670s and 1680s. Salmon lists the various uses of scurvy grass and the ailments it cured. Scurvy grass was quite popular in the latter half of the century and was useful for all sorts of things: as an aperitif, cosmetic, digestive, diuretic, emmenagogic, sudorific; it cured scurvy, relieved obstructions of the liver, spleen, and womb, cured palsy, “all sorts of sores,” ulcers in the mouth, and skin conditions. Just in case anybody cares, what modern scholars identify as scurvy grass could not cure the disease we call scurvy, unless you consumed acres and acres of it (see the post on the scurvy epidemic). I doubt that scurvy grass was more effective at relieving those other issues Salmon listed. Salmon had previous published quite a number of texts, e.g., his Synopsis Medicinae, or a Compendium of Astrological, Galenical, and Chymical Physick and other texts on medicine and surgery, a volume on drawing, a prophetic almanac, theological texts on baptism and transubstantiation. In some of these texts, Salmon advertised pills he sold, which he promised would cure a vast array of diseases. I suspect there is an interesting connection between the authors of herbals and the sale of panaceas.